Christopher Nolan is back in the saddle after his triumphant Batman Trilogy. It must have been a struggle to think of something to follow that. 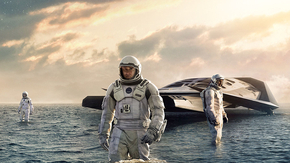 In keeping with his back catalogue, Interstellar expands the filmmaker's eclecticism even further, this time into the realms of science fiction. The world is dying and Matthew McConnaughey must fly through a wormhole near Saturn to find a new home for humanity. Sounds like a simple plot, huh? Nope. This is a Christopher Nolan movie remember. As well as delivering a particularly mind-bending (and time-bending) twist, Nolan maximises complexity by fitting in enough technobabble from scientists to fill a three-hour lecture. It comes across as authentic but I felt like I should have brushed up on my astronomy, astro and quantum physics by the end. He also deals with more identifiable themes like the tragedy of loss of loved ones, effects of prolonged isolation on the psyche, humanity's inbuilt will to survive. All well and good throwing all that in there, but can you entertain us while you're doing it, please? McConnaughey's performance is as serviceable as ever but when he has a vacuous Anne Hathaway and other anodyne scientists to interact with in a confined space, you're asking for trouble. I still would have creamed myself if she said she was adaptable. Catwoman. Cat who got the cream. That's where I was going with that. This is Hans Zimmer's least imaginative score. It sounds like he's doodling with a church organ. A bit more synthesiser wouldn't have gone amiss, Hans. Get your Moog out next time. There's an awful lot of crying and I think maybe the film wants you to cry too. It toes a thin line that nearly falls into the pit of schmaltz. Matt Damon turns up at one point and I thought hang on, you were in a much better sci-fi flick last year, Elysium. The robots are way cooler in that film. Not like the pre-iPod silver MP3-player look-a-likeys that adorn Interstellar. With the Batman trilogy, especially the last one, you get some plot holes. You can usually get over them because the rest of the film is so good. I struggled reconciling them with this one. I don't hate this film but it's not the classic we have come to expect from Nolan.